UK Cloud Infrastructure focuses on providing a service with the use of varying computer resources, both hardware and software, over the Internet. These UK Cloud Infrastructure providers offer a varying range of services within the IaaS and PaaS models, from cloud hosting to cloud backup services. 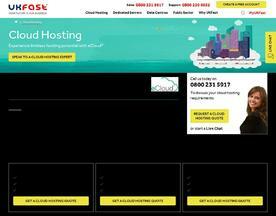 If you’re interested in similar online services that are akin to UK Cloud Infrastructure, try our Cloud Hosting and Hybrid Hosting categories.